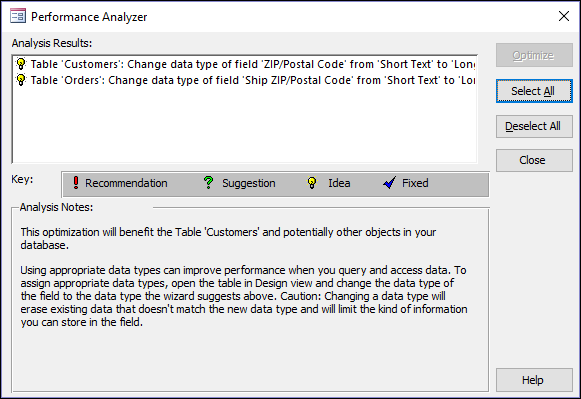 You can use the Performance Analyzer to optimize the performance of a Microsoft Access desktop database. The Performance Analyzer is not available in an Access project or in Access web apps. The Performance Analyzer looks at the structure of the database as well as the data, and makes recommendations to help you improve performance and prevent confusing data errors. You can analyze individual database objects, such as a new table you are adding to an already-optimized database, or select all the objects to analyze the whole database at the same time. Open the Access database you want to optimize. On the Database Tools tab, in the Analyze group, click Performance Analyzer. 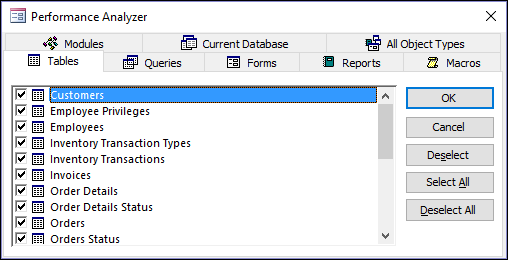 In the Performance Analyzer, click the tab for the type of database object that you want to optimize. Click the All Object Types tab to view a list of all database objects at once. Select the names of the database objects that you want to optimize. Click Select All to select all database objects in the list. Repeat steps 3 and 4 until you've selected all the objects you want to optimize, and then click OK to run the analysis. Note: The Performance Analyzer doesn't provide suggestions on how to improve the performance of Microsoft Access itself or the system it is running on. The Performance Analyzer lists three kinds of analysis results: Recommendation, Suggestion, and Idea. When you click an item in the Analysis Results list, information about the proposed optimization is displayed in the Analysis Notes box below the list. Recommendation optimizations are straightforward improvements that don't entail serious tradeoffs. Access can perform Recommendation optimizations for you. Suggestion optimizations have potential tradeoffs that you should consider before performing them. To view a description of the tradeoffs, click a Suggestion in the list and then read the information in the Analysis Notes box. Access can perform Suggestion optimizations for you. You must perform Idea optimizations yourself. To perform an Idea optimization, click the optimization, and then follow the instructions displayed in the Analysis Notes box. Click one or more of the Recommendation or Suggestion optimizations you want performed. To perform all listed optimizations, click Select All. The Performance Analyzer performs the optimizations and marks them as Fixed. Repeat as needed until the Performance Analyzer has completed all Recommendation and Suggestion optimizations that you want it to perform.